My trip this month is a local one – to La Fortaleza, the medieval fortress and Alcazaba in Vélez-Málaga, capital of the Axarquía region. Of course, as with many other places, I see the fortress towering above the town every time I pass by, but somehow never got around to visiting before now. La Fortaleza was in a bad state of repair for many years and, as a result, was not open to the general public – but that has now changed. Located on the highest point of the town, about 80 meters above sea level, the Alcazaba or Fortress was built during the 10th century under Moorish rule, but achieved its greatest prominence during the 14th and 15th centuries, as one of the most important strongholds of the Nasrid Kingdom of Granada. It’s worth remembering that the River Vélez was once much deeper and wider than it is now, and that the valley formed part of a trade route through the Zafarraya Pass from Granada to Málaga, making the town strategically significant. Vélez-Málaga may not have been a very large town, but it was well fortified and defended by a solid set of walls, some of which can still be seen. As with many Spanish monuments, the directional signage to La Fortaleza leaves a lot to be desired, but if you head for the Fernando Hierro Sports Stadium in Vélez-Málaga and take the Arenas road, following signs for La Iglesia de Santa Maria/Museo de la Santa Semana, you will find the Alcazaba (La Fortaleza) just before the church. 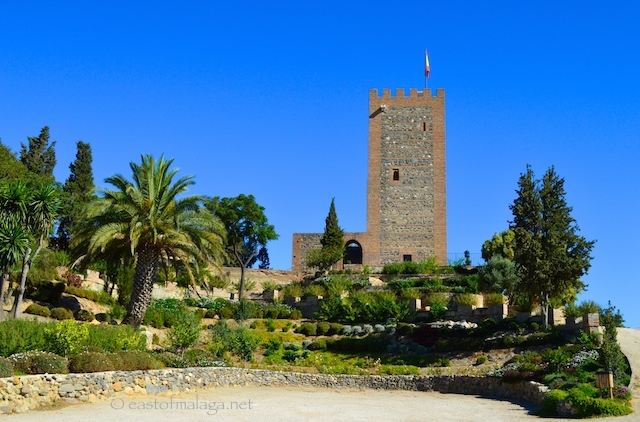 The restored Tower of the Alcazaba (the fortress La Fortaleza) is open every Saturday and Sunday from 10am – 1pm and offers spectacular views over the town and the surrounding Axarquía countryside. Admission is FREE. Each month, visit somewhere and then write about your trip or describe it using photographs – whichever suits you best. 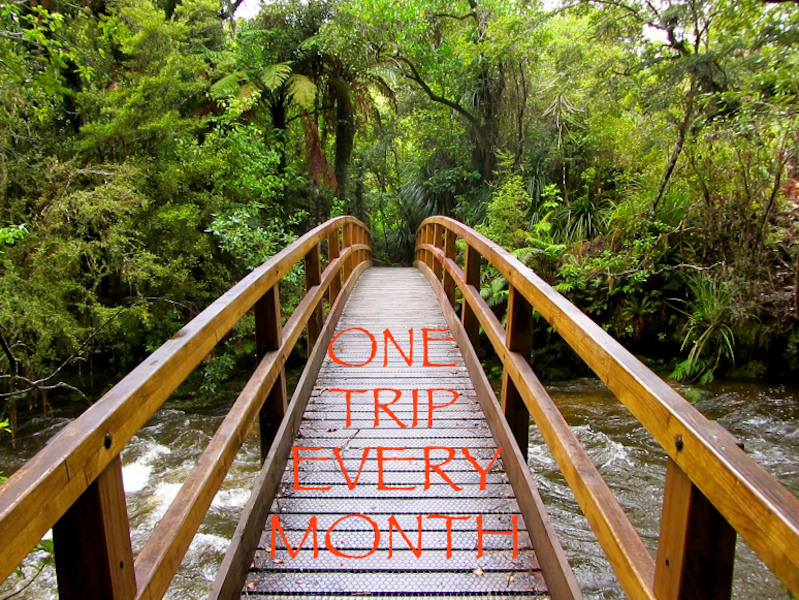 Don´t forget to title and tag your entry ’One Trip EVERY Month Challenge’, and link back to this page. Display the Challenge logo on your post or in your sidebar. Are you ready to join me by taking ONE TRIP EVERY MONTH? What are you waiting for? GO! This entry was tagged Andalucía, culture, East of Malaga, Europe, history, Malaga, One trip EVERY month, One trip EVERY month Challenge, photography, Spain, travel, Velez Malaga. Bookmark the permalink. I’m really enjoying reading all about these beautiful places you visit, you’re doing a great job it’s much appreciated. I do remember reading about a recommendation you made to a very informative blog site by a lady you found to be very interesting and well written. If you can remember the link to her blog I would be grateful if would let me know. I have tried searching some older posts with out success. Any help would be greatly appreciated. OH now there’s a challenge! Can you give me a clue? Was it a blog about a certain area of Spain? OH – I’ve just thought, it was probably when I used to do my monthly CBBH photo challenge when I referred to a couple of blogs. If you type in CBBH to the search box near the bottom left of this blog page, it should bring up a list of articles – but you’ll have to look at each of them to find the one you want. Good luck!! Penned in to visit. Should be in the area in about 4 months time. Going to be thoroughly “rubbernecked” out by the time we finish our holiday! Excellent! If you need any more help in planning places to visit – give me a shout, won’t you, Chris? Beautiful! It’s so close to us yet I’m ashamed to say we’ve never visited. And free too! Another wonderful freebie. That is way isn’t it. You can see a place, discuss a visit and within the blink of an eye seemingly, years have passed. The fortress and the gardens look amazing but the view is stunning. Wonderful that it’s been restored and now accessible. And, as you rightly say, Ella, another wonderful freebie. I felt sure we would have to pay a small fee – but no. Immediately afterwards we visited a nearby church, containing the museum of the Holy Week celebrations, which was fascinating and also FREE. I’ve visited the fortress a couple of times but many years ago when it was very unkempt and used by dubious sorts as a meeting place. Perhaps it is time for a return visit. The church nearby is really charming, I believe it was painted by Francisco Hernandez, the artist who decorated the Cómpeta church. Yes, well worth a return visit, Maggie. It was ages ago that I went Marianne. I am sure the church I am referring to was very close to the fort. The walls were covered with what I think would be termed ‘niaive’ paintings. I wasn’t aware of the museum, or the terrace door. I think I need a return visit! I’ll put this on my list of things to see when we get to Spain. Thanks! I guess the gardens were restored, too. Most of the old trees up near the fortress are huge pines – which I love. There were millions of big, brown pine needles scattered on the ground all around their bases – and a lovely scent of pine, too. Excellent! I love learning about other places and of course, love your photography anyway. I might even sign up for this. Meanwhile, I’m just happy to envy you all that you enjoy in Malaga! Thanks for your very kind comment. Much appreciated. I still luuurrrrrv that it is called Fortaleza…that cracks me up. But what a great place Marianne. Well, of course, Forteleza is the Spanish word for “fortitude, fortress, resolution, stronghold” – so I guess it’s aptly named, Jo! Maybe you should go in and ask them why it’s called Fortaleza – their answer might be interesting. Yes, they ARE, aren’t they? Oh my! The climb up the tower seems so worthwhile! I particularly LOVED the view showing one of the main streets down to the coast at Torre del Mar. Looks so amazing! I do wish you’d stop with the blue sky pictures though 😉 13 degrees and raining here at the moment – hard to get in the summer mood! An interesting place, Marianne. Those walls certainly do look very thick. 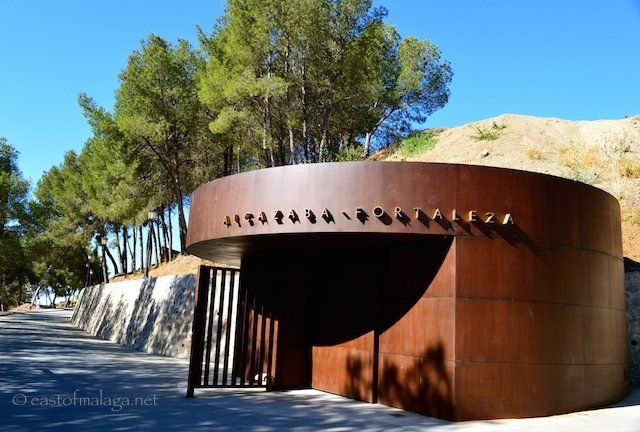 I’m scratching my head because i think I have been here, years ago though…I don’t remember that entrance and also I am thinking of the fort in what I call old Malaga…same place? Maybe you have visited, Wendy, but you wouldn’t have been able to go inside years ago. I don’t know how long the entrance has been there, but I’m thinking it’s pretty modern (maybe within the past ten years or so?). Yes, it’s quite a view from the old fortress, isn’t it? I love looking at things or places from a different perspective. PS: great pics Marianne as ever!